When you come to Arrowmont, our goal is for you and your family to feel like family while you are here and have a great stay in your vacation cabin along with a fantastic trail ride and a great destination venue at THE FORT. You can watch a horseback ride pass in front of your cabin or enjoy a "visit" from the horses at the end of their work day... all from your cabin's front door. Or you may watch the sun rise over the mountain peaks while laying in bed. These are only a few of the things you may enjoy while here. This is not ordinary... You can see we are Not in the middle of downtown. You can get that anywhere. But you can't get this anywhere. That's why we want to share our "mountain hideaway" with you. So You too can experience the majesty of this place we call home. God truly out did Himself here! These mountains are simply too extraordinary to keep to ourselves. You have 2 comfortable and simple vacation cabins available on 200 acres of mountain top adventure. The cabins have 2 bedrooms, 1 bath, living room with a fireplace and a full kitchen. All you need to bring are your clothes and food ...and maybe your chef. The linens and towels are provided for the bed and bath. The larger cabin can sleep 6 and has an awesome view of seeing above the morning mist. The smaller cabin sleeps 4 and you enjoy watching the horses go by on their trail rides. They may even visit you after work when they're set free. That's why the front gate is kept shut... to keep the horses in. There's also an easy way for you to hike. It's called horseback riding. Were You Looking For A Great Place To Ride? How about Trails that take your breath away! You get the best Trail Ride Program in the Southeast... maybe even the country! At least that's what our Guests tell us and everyone else. You get a choice of 5 majestic walking trails with a variety of terrain. 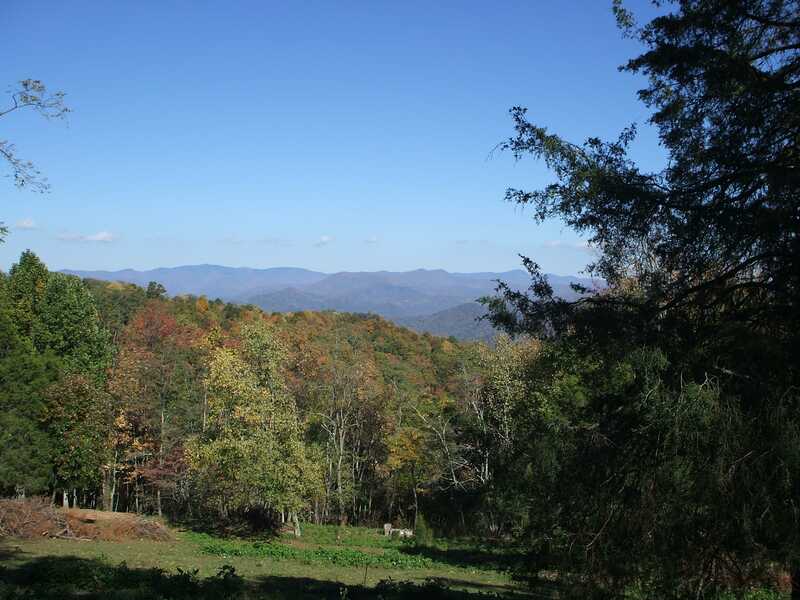 There's mountain tops with incredible 30 mile views out to the Blue Ridge Parkway. You also have a picturesque valley with creeks, streams and a small lake. Follow Rough Run stream back up the mountain and return to the stables through a lush, deep wood Fern Forest. The trails vary in time from approximately 45 minutes on up to about 2 hours. In addition to your trail time, plan another 45-60 minutes for your Safety Program. This is where you are shown how the horses are trained, some about horse personality as well as safety points. Then you are given an opportunity to try your horse out in the ring before going on the trail. If needed, we can change your horse before you get out on the trail. Looking for a DESTINATION VENUE for your SPECIAL EVENT. Well look no further. THE FORT of Arrowmont is a charming and friendly Rustic Venue for your wedding, party or business social event. It can comfortably accommodate up to 120 people or as few as 10. For RESERVATIONS CALL TODAY (800)682-1092 … or Check Availability Online and Book NOW at www.arrowmont.com.